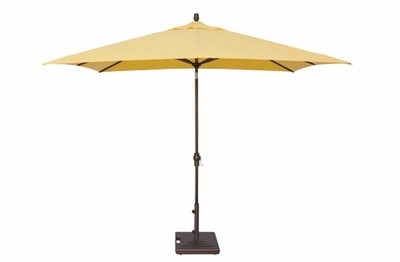 Our Treasure Garden Market Aluminum 8' x 10' Square Collar Tilt Patio Aluminum Umbrella offers a substantial amount of coverage for your outdoor dining or lounge area. With its sizeable canopy, this umbrella easily shelters a very large dining area or your luxurious deep seating set. This high quality umbrella is both sturdy and durable designed to endure from season to season. A variety of fade resistant colors are available to coordinate beautifully with any outdoor decor. With this outdoor umbrella you and your guests will have it made in the shade. * Shade Size: 8' x 10' ft.
* Weight: SWV: 20 lbs.